•Appeared in three games, averaging 2.0 (3-5 FG, 0-2 3pt), 0.7 rebounds, 1.7 assists in 6.3 minutes per game. •Appeared in seven games, averaging 26.3 points (.537 FG%, .450 3pt%, .919 FT%), 5.1 rebounds, 8.4 assists, 1.4 steals in 34.9 minutes per game. •Has scored 20 or more points in six games, 30 or more three times. •Signed to a two-way contract on October 17, 2017, joining Chris Boucher as the Warriors two-way players. •Made Warriors’ debut at Memphis (10/21/17), recording two points (1-1 FG) in 43 seconds off the bench. •Was not selected by an NBA franchise in the 2015 NBA Draft. •Signed by Cleveland on 9/29/15 and waived on 10/24/15. •Signed by New Orleans on 9/24/16 and waived on 10/22/16. 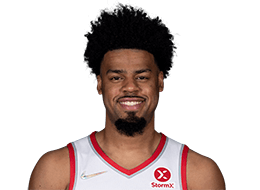 •Appeared in five games off the bench for the Mavericks, totalling 27 points (.440 FG%, .357 3pt%), three rebounds, 12 assists and one steal in 77 minutes after signing with Dallas on 2/26/17. •Finished the 2016-17 season with the Pelicans, appearing in nine contests, totalling 52 points (.537 FG%, .500 3pt%), four rebounds, 14 assists, three steals in 111 minutes off the bench after signing with New Orleans on 3/19/17. •Signed by Atlanta on 9/5/17 before being waived on 10/14/17. •Appeared in 43 games (37 starts) with the NBA G League’s Canton Charge, averaging 19.6 points, 5.4 assists, 3.9 rebounds and 1.2 steals in 33.7 minutes per game in 2015-16. •Named the NBA G League Rookie of the Year in 2015-16. •Named to the 2016 NBA D-League All-Star Game. •Earned All-NBA Third Team and NBA D-League All-Rookie Team honors in 2015-16. •Was a four-year letterwinner a Duke and helped the Blue Devils win the 2015 NCAA National Championship.